Iron is a very frequently occurring undesirable element in groundwater in Estonia. For the analysis, first guess the expected iron content in water, is it high or low, in order to choose the right procedure. The high iron content is analyzed in the range of 0.25 to 15 mg/l. 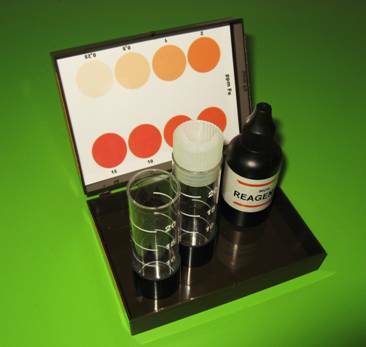 The high iron content: This method is commonly used to assess the iron content in raw water purification. Fill two test tubes of 5 ml volume with test water. In one of the tubes add 6 drops of indicator, close the cap, mix and let it stand for 5 minutes. Another test tube of water is needed to compare the glasses, that the waters natural color does not distort the evaluation. To determine the iron content in the sample, compare it to the test image. To do that place the test tubes with the holder on the image which shows the high iron content. Remove the cap on the test tube and slide the holder so, that the water filled test tube moves along the test colors and the colored sample is on a white background. Find the closest matching color on the test, compare the colors from the top vertically looking through the tube. On the test picture the iron contents values are in mg/l Fe. Low iron content: the analysis is used for measuring mostly filtered water's residual iron content in the range of 0-0.5 mg/l. The procedure is exactly analogous to the one described before, only that test tubes should be filled with 20 ml of the test water, and 24 drops indicator should be added. After 5 minutes, compare the color with the low iron content image.